It looks like the slime making fad is here to stay. As a mom, I was weary about it at first, because I knew it would require lots of cleaning up on my part, but eventually I began to appreciate how much it kept my daughter engaged. It gives her a creative outlet, and can be inspired by literally anything she likes. These days, Pinterest boards are buzzing over a new, glittery, wintery slime inspired by the movie Frozen. The slime has a cool arctic look, and it's actually pretty easy to learn how to make Frozen slime. If you and your family want to hop on this ice-cold slime trend, you'll be surprised at how easy it is. There are a few different ways to make slime in general. According to slime expert Anusheh Zafar, depending on what ingredients you would like to use, slime recipes will differ. “You can make your slime base with glue, combined with either Borax or laundry detergent, depending on which ingredients you’re comfortable handling.” She says that if you find Borax to be too harsh, or are making slime with younger kids, you can stick to a base of glue along with either detergent or liquid starch. Zafar adds any of these ingredients can irritate skin, so it’s important to figure what is safe for you and your family. So how do you make Frozen-inspired slime? There's a great tutorial from Little Bins for Little Hands. 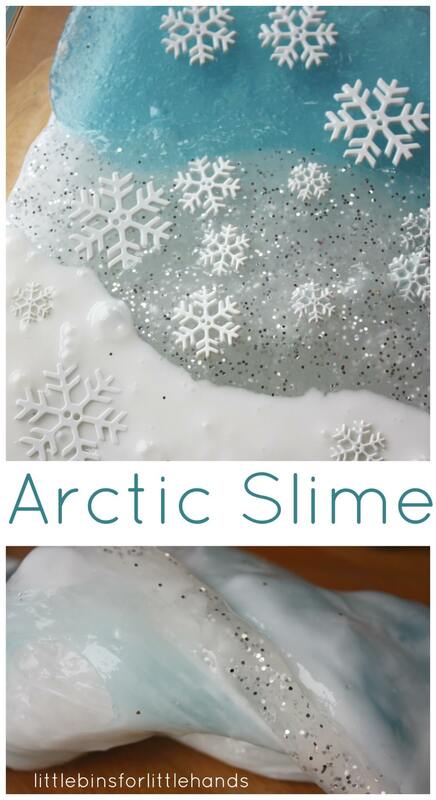 The website calls their version of slime Arctic Slime, but you can't deny the Elsa inspiration with those wintry colors and snowflakes. With just a few simple ingredients like white glue ($2, Target), clear glue ($4, Five Below), liquid starch ($4, Walmart), water, teal food coloring ($3, Target), blue glitter ($4, Amazon), snowflake confetti ($7, Amazon), a spoon, and two mixing bowls, you can create your own winter wonderland to keep your kiddos busy on those cold days inside. You can start by mixing the opaque slime, for which you will first combine half a cup of water with half a cup of glue in a mixing bowl with a spoon. Once combined, Zafar says you can add your glitter and confetti. Then, she says you can slowly stir in the liquid starch, and once it becomes thick and smooth, you can begin kneading the slime with your hands. For the clear slime, Zafar suggests mixing half a cup of clear glue with a half a cup of water in the other mixing bowl. Once it is mixed, you can add a drop or two of blue food coloring along with some of the snowflake confetti and glitter. After that is all well incorporated, you can begin stirring in half a cup of liquid starch, a little at a time, until it reaches a smooth slimy consistency. Then you can knead that slime as well. Once both of the slimes are complete, lay your opaque slime out on a surface and then place your clear blue slime on top of it. Then you can gently fold and twist the slimes together, but Zafar warns not to aggressively mix them. “If you mix them too much, you may not be able to see the clear slime, and it may all become opaque.” So to keep them distinct, the folding technique is the best Zafar suggests. Because slime can be customized to your liking, you can get creative by using a combination of different color glitters, food coloring, and decorative confetti. For example, if you like, you can replace your snowflake confetti with this cool Disney Frozen Decorative Confetti ($5, Amazon) or use this Silver Snow Glitter ($7, Amazon) instead of the blue. Once your Frozen-inspired slime is ready to play with, you can bring in any Frozen toys or figurines to take your play even further. You can create a slime ice rink for your Elsa and Anna figurines to skate on, or create a slimy winter wonderland for Olaf to sing in. With just a little imagination, slime can take your creativity to a whole new level. All you need to do is let it go.